Add papaya to mince and set aside for 1 and a half hours. This will make meat much tender and healthier. Add all the other masalas and mix well. Roll into kebabs over skewers and barbecue. You can also shallow fry in very little oil. Obviously the barbecued kababs are much yummier and have that smokey flavor to it. 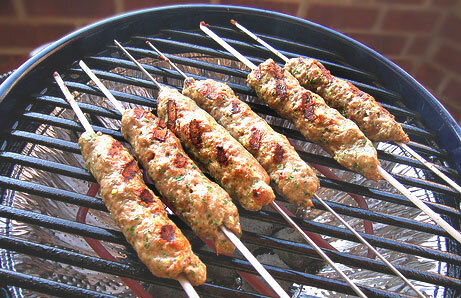 How do you manage to keep your seekh kababs moist and juicy? plz help, mine dry out or become to soggy. Thankxxxxxx. Enlight a coal on a burner , when it turns red then keep on a piece of bread on the kebabs , drop some oil on it and cover it with the lid of the pan . This will give a smoke aroma in the kebabs . Hi! Your recipe sounds interesting. Kindly tell me what is coal bhagar?? and how to do it? Kindly mail me the reply. Thanks Neelam Saxena. very good recipee. I would like to try this but didn't understand what coal is. You said coal (baghar it) for one hour. Kindly make me understand.